Ricky lives in Bristol. By day he works as an animator- which is lucky because he loves art. He lives for art. He even dreams of art. He draws, he paints and - with his friends and members of his family who drop by - he makes ninja moves. 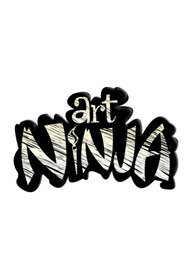 That's why some people call him the Art Ninja.